The Chemistry of Synthetic Dyes, Volume IV is a critical assessment of patent literature and scientific journals on the synthesis and applications of synthetic dyes. This volume is composed of seven chapters, and begins with a discussion on the application of dyes in textile fibers and printing, as well as in dyeing industry. A chapter provides a general description of dyeing, other properties, and applications of basic dyes. These topics are followed by a survey of the classification and potential application of cationic dyes. Another chapter focuses on the synthesis and reaction mechanisms of cyanine dyes. The final chapters look into the principles and chemistry of the formation of images by oxidative coupling. 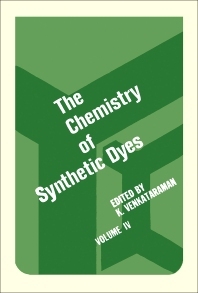 These chapters also examine the general laws governing the photochemical processes of dyes and of other organic compounds; the photochemical reactions of dyes in solution; the light-fading of dyed textiles and other dyes substrates; and the effect of spectral sensitization and special photo-reactions of dyes. This book will prove useful to organic chemists and technologists who are concerned with the synthesis of dyes and their applications.